As a manufacturer we refurbish your knife - with the same precision you would expect from our new knives. This way you can save up to 70% of procurement costs and achieve an optimized return on investment. Send us your knife. Prior to processing, specialists will access its condition, determine refurbishment viability and send you a cost-effective offer. 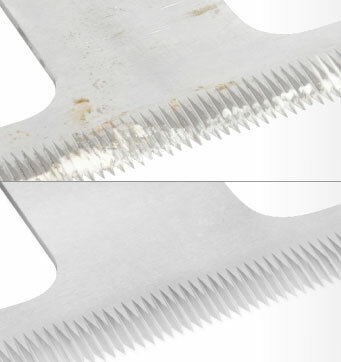 Refurbished knives from Winterhoff Picard attain performance values that are very close to those of our new knives, because in addition to regrinding and adjusting the knives, we naturally also apply a new coating and finish. Refurbished knives in manufacturing quality.